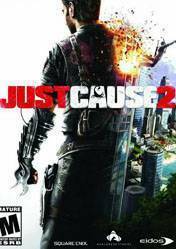 Just Cause 2 is an open world action-adventure video game developed by Avalanche Studios, published by Eidos Interactive.The player is free to roam the game\'s open world, not having to focus on the game\'s storyline. Progress in the game is measured with Chaos, which is earned by completing missions, destroying government property, collecting items for the factions and reaching 100% completion in settlements and military bases. Chaos unlocks new agency missions and stronghold takeovers. Chaos and stronghold takeovers expand the factions\' area of influence, which unlocks faction missions and race challenges. Agency missions progress the story, while faction missions are completely optional. Helping one faction does not prevent the player from helping the others. Such a freaking awesome game. the gameplay and open world are so much fun. there are a lot of mods but the best one is multiplayer. The car crashing is also so awesome!!! A great game that have a great map size, that can be explore and find many things that bring a great experiencies and have a great mod of multiplayer that extends the experiences. Back when this was the only fun open world GTA-like game to play when everybody else was playing GTA IV. Explore an island with crazy vehicles, weapons and grappling hook. Put grappling hook on everything while doing stunts in and out of driving at insane speed vehicles! People following you too close? Grappling hook their car to the ground and see the result! People NOT following close enough? Grappling hook their car to your OWN car! And start a freaking conga line! Then link that to a plane! Because yes, there are not only cars, motorcycle, and tuk-tuk, but also planes. And when you are bored with majestic grappling hooking like Spiderman, call your favorite delivery man to get a tuk-tuk... with a giant gun!